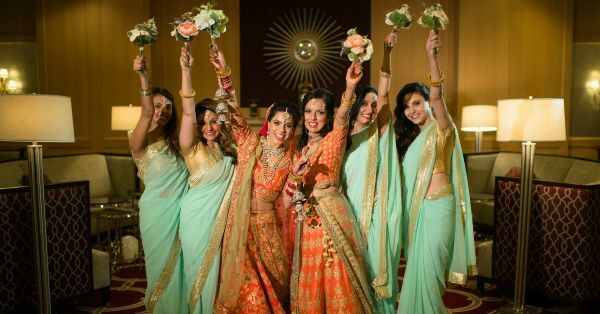 10 FAB Ways Your Bridesmaids Can Coordinate Their Outfits! 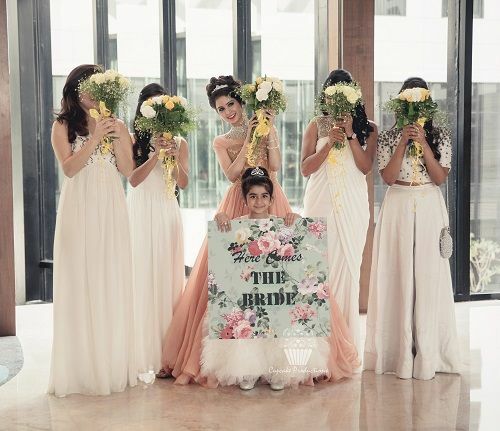 Dear brides-to-be, being the bride's bestie or sister is no easy task. They have a lot of work on their plate and you definitely want them to stand out in the crowd on your wedding day. And honestly, don’t you want your gorgeous bridal brigade to look different from the rest. Maybe even wear coordinated outfits! Here are 10 ideas for bridesmaid outfits that we’re sure you’ll love. 1. Twining is so fun! Image: PhotographicK The first and the most obvious option is to get exact matching coloured outfits for all of them. While size and fit might be an issue with lehengas and salwar suits, sarees make your job easier. Pick a colour or style that’ll go with a basic gold/silver blouse that the girls can get themselves. 2. Different styles for the win! Image: Cupcake Productions Pick a common colour but let the girls take a call on the type and style of outfit. 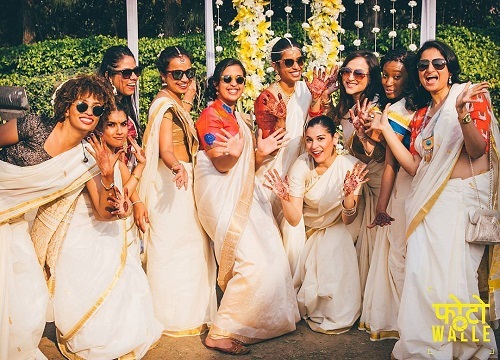 From lehengas to crop tops, gowns and palazzos… Let there be tonnes of variety. It’s best to get all these outfits stitched from the same designer to avoid different shades and varied embroidery styles. 3. For the girls who love jewellery! 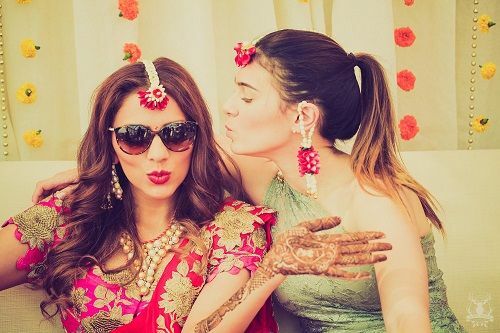 Image: Morvi Images How gorgeous does the bride look in floral jewellery?! And her friend is wearing florals too! If you too are planning on wearing flower jewellery at your mehendi, get different varieties of it for your besties. We swear, it looks super cute! 4. Same same but different! 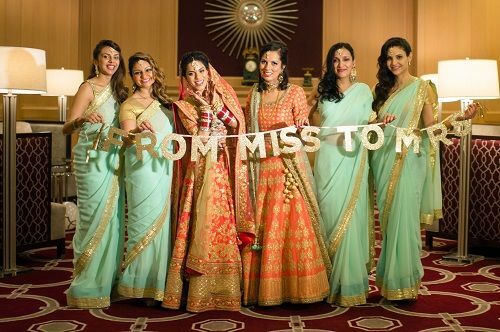 Image: Shared by the bride, Richa We love how the outfits of the mother and sister come from the same colour family as that of the bride. All three outfits are a beautiful shade of pink with golden sequins. 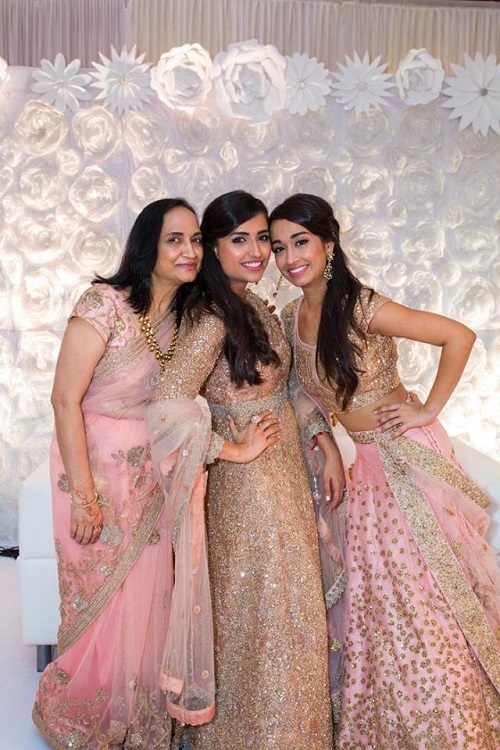 While the bride has sequins all over, the mom and sister have toned down their outfits a bit. 5. Perk up that blouse! 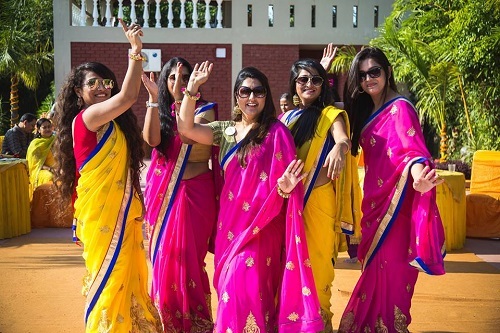 Image: Fotowalle on Instagram Get all your besties a neutral coloured saree and ask them to go all out with the blouse. Does this not look like a totally fun image with all the ladies in cream coloured sarees and blouses in different colours, prints and styles?! 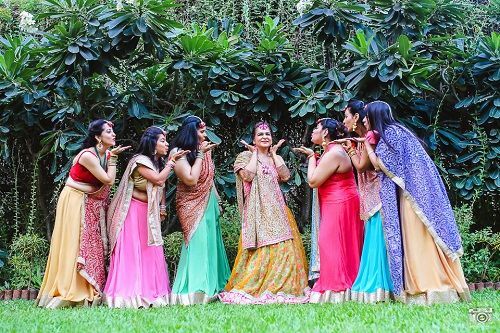 Image: Nishant Suri Photography Two vibrant colours, similar outfits with prints and embroidery to match… Now that’s how you can brighten up your mehendi function! Let there be more than just one colour but keep the work on the outfit same. You could even choose an interesting print for all the girls to sport. Image: Fotowalle The easiest thing to do? Get all your girlies pretty little floral wreaths as hair accessories. Not only will it make them stand out in the crowd but it sure will look extremely pretty too! Image: Morvi Images Stunning right?! 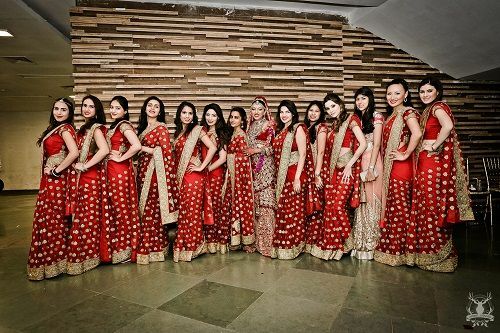 A gorgeous bride in a red lehenga and all her bridesmaid wearing sarees in the same colour. Imagine how spectacular the bridal entry would look with all the pretty girls and the bride walking down in stunning red outfits. 9. 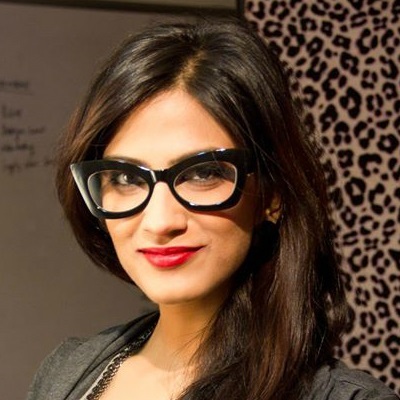 Jazz up the dupatta! 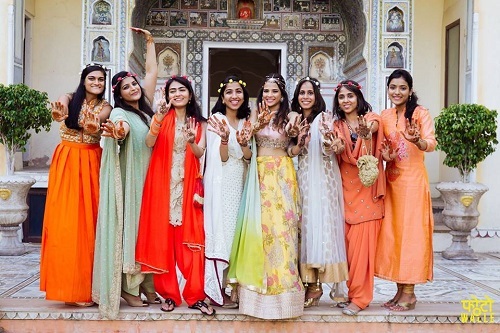 Image: Two Fireflies One Camera All the bridesmaids wearing pretty red and blue dupattas just like the bride’s… Something we all could do, right?! It’s fun, it’s cute and it sure will make all your besties feel super special. 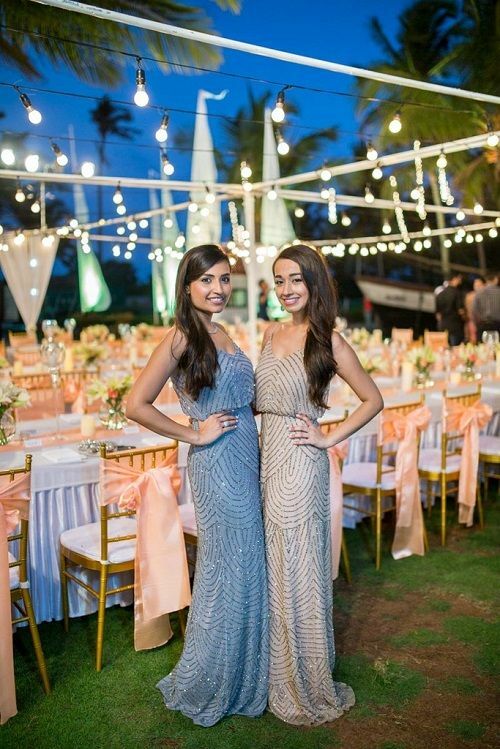 Image: Shared by the bride, Richa Awww… Such pretty sisters! And their stunning coordinated gowns in two different pastel colours is giving us all the fashion and sister goals right now! Super pretty these two! You can try this with your sister and best friends too.